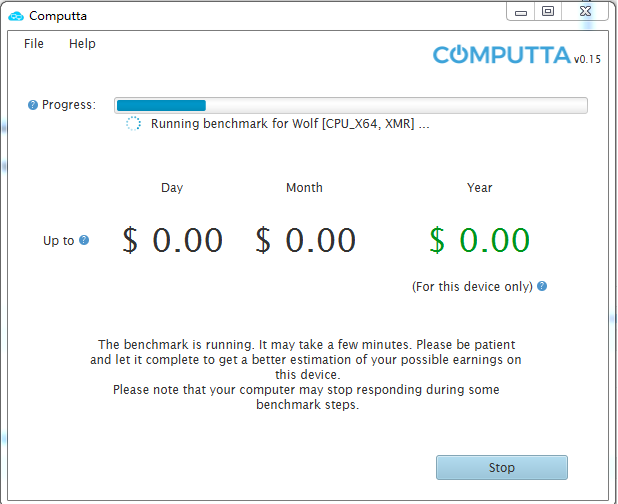 Benchmark is the process run by Computta Smart Miner software upon initial install to estimate your device’s computing power and calculate your potential earnings from this device. All it does is check your computer’s CPU type and power and Video Card’s (GPU) type and power and then calculates real time estimation of the earnings from this hardware’s computing power. 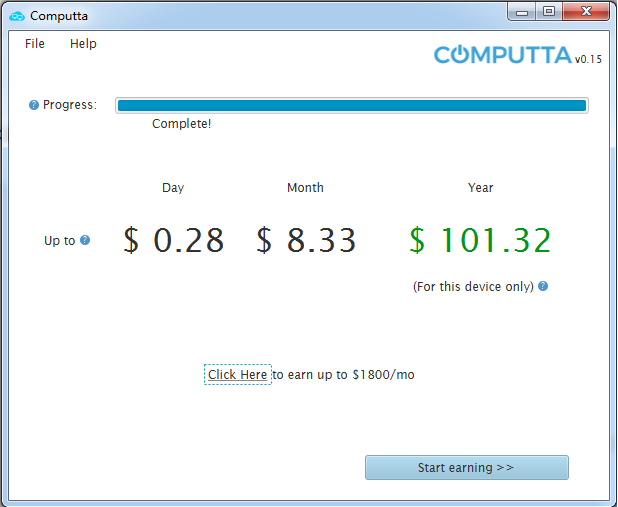 When you first download and click to install the Computta Smart Miner it will tell you start the ‘benchmark’ process. When started it can take up to 4-5 minutes and you will see progress and potential earnings separately from your CPU and GPU right there onscreen. After it completes and shows you the total potential earnings from your device, you need to press “Start Mining” button and it will switch into the mining mode and will show you the main screen where you will see the mining process and your earned money in real time. Benchmark is a great tool that helps you understand your computing power and estimate it in terms of direct earnings from the device. Benchmark can predict your possible monthly and annual earnings. The calculations are based on a complicated algorithm. We take into consideration several variables. Besides the most important CPU and GPU power they include such factors as currency current exchange rate, network difficulty, which is constantly changing depending on the average hash rate of the network. We also assume in the calculation that you will be running Computta for at least a year as the longer you keep at it, the more profitable it gets. Please note that if any of these factors change, it can have an impact on the real earnings from your computer device.